A sauce is the crowning glory of any dish. From the basic "five mother" sauces, there are literally hundreds of variations of sauces that are used to dress, complement, enhance and bring out the flavor of the food it is served with. CooksRecipes has hundreds of quality, kitchen-tested recipes for sauces and condiments. Find recipes for savory sauces, dessert sauces, fruit sauces, syrups, marinades, barbecue rubs, seasoning mixes, mustards, salsas, chutneys, relishes, pickles and much more. 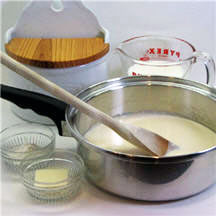 Bechamel—or white sauce—is one of the five mother sauces, and the basis for many classic dishes. 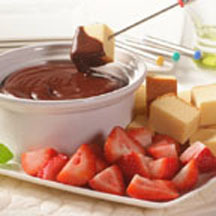 Basic pantry ingredients make a creamy chocolate sauce you'll have trouble holding back on.